Μετά τα γεγονότα στη Λυόν πριν από ένα περίπου μήνα και μετά την σχεδόν απόλυτη κυριαρχία του ρατσιστικού κρατικού λόγου στη Σουηδία κατά τη διάρκεια αλλά και μετά τις ταραχές, στην φάση της “ανάλυσης τους”, τώρα έρχεται η σειρά προληπτικής καταστολής αντιφασιστών και στην Αγγλία. Small groups of English Defence League supporters met in cities and towns including Sheffield, Cambridge and Colchester, and 150 members of the British National party met at Westminster. In London and elsewhere, the protesters were outnumbered by police and anti-fascist demonstrators. The protests were triggered by the killing of Drummer Lee Rigby in Woolwich last week by two men who claimed to be acting in the name of Islam. Police said 31 people were arrested after members of Unite against Fascism refused to move to let the BNP march to the Cenotaph in Whitehall. Police had earlier rejected a plan by the BNP – which claims to be anti-extremist but which opponents say is racist and anti-Islam – to march from the site of the killing in south-east London to a nearby Islamic centre. Police, politicians and activists have reported a rise in anti-Muslim incidents since Rigby’s death on 22 May. The two prime suspects in the killing were recently discharged from hospitals after being shot by police on the day of the killing. Michael Adebowale, 22, has been charged with murder, while 28-year-old Michael Adebolajo is being questioned. Several others have been arrested and questioned in connection with the attack. Most have been released on bail. 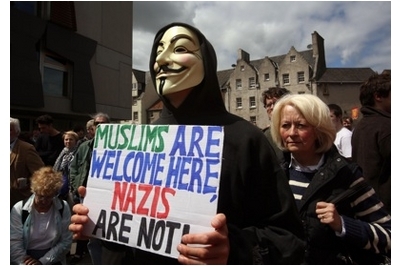 In Edinburgh, the Scottish Defence League protested outside the Scottish parliament, while Unite Against Fascism organised a counter-protest. Police kept the two groups apart but the protesters dispersed without incident. This entry was posted in ΝΕΑ ΑΠΟ ΤΟ ΜΕΤΩΠΟ and tagged ΑΓΓΛΙΑ, ΚΑΤΑΣΤΟΛΗ, ΜΕΤΑΝΑΣΤΕΣ, ΡΑΤΣΙΣΜΟΣ on June 2, 2013 by simeioseis.